High-accuracy analyses of polycyclic aromatic hydrocarbons (PAHs) in lipid matrix-based biological samples are highly necessary. 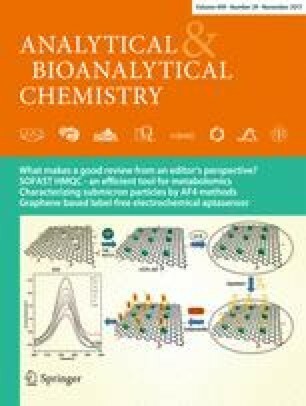 We investigated the cleanup performance of the commercially available molecularly imprinted polymers (MIPs) to analyze PAHs in various biological samples (i.e., butter, peanut oil, pork belly, and human umbilical cord), and compared this method with the commonly used gel permeation chromatography (GPC). After primary cleanup with a MIP or GPC column, the extracts were further cleaned with a neutral aluminum oxide column. Then, we measured 16 PAH congeners using gas chromatography-mass spectrometry. The MIP method allowed PAH recovery levels as high as those measured with the GPC method to be obtained. More than 95% of the crude fats of butter, peanut oil, and pork belly were removed, although only ~ 50% were removed for human umbilical cord. The scan-mode ion chromatograms of the final extracts cleaned with the MIP method had responses similar to solvent blank for the four types of samples, which were slightly better than those cleaned with GPC. Moreover, the PAH concentrations in the MIP operation blank were generally lower than those of GPC operation blanks. These results indicated that MIP could be applied to the analysis of PAHs in various lipid matrix-based biological samples. The online version of this article ( https://doi.org/10.1007/s00216-017-0646-6) contains supplementary material, which is available to authorized users. This research was supported by grants from the National Natural Science Foundation of China (No. 41401583, 41771527, and No. 81673177). We greatly thank other colleagues in the Institute of Reproductive and Child Health, Peking University for their help in providing various biological samples and coordination work.